The banking industry has faced a variety of challenges over the last decade, with one of the most significant being the flood of new and expanded regulations. Yet banks across the country have shown resilience in the face of this onslaught and continue to support economic growth. While the industry today is much smaller than it was a decade ago, it is in many ways safer and stronger than it was in the years prior to the financial crisis. Consolidation is the most obvious consequence of the pressures felt by banks since the Great Recession. There are currently about 3,000 fewer banks operating in the United States than there were before the financial crisis. 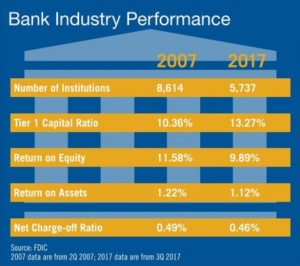 Equally troubling is the fact that there have been, as of press time, just seven de novo banks in the nearly eight years since Dodd-Frank was enacted. The institutions remaining paint a picture of remarkable strength, with high capital and strong asset quality. Capital levels have never been higher; total equity capital is $670 billion greater than it was just prior to the crisis. Capital relative to assets has also improved, increasing from 10.43 percent to 11.34 percent today. Capital ratios currently sit at historic highs, with an industry-wide tier 1 capital ratio of 13.27 percent and leverage ratio of 9.70 percent. The industry is well capitalized and stronger than it was a decade ago. Moreover, the industry is healthier today because of the strengthened quality of loans. The net charge-off rate has declined to levels below the pre-crisis rate of 0.49 percent, while the percent of loans that are noncurrent continue to move back down toward pre-crisis lows. Similarly, the coverage ratio is nearing its pre-crisis level of 119.5 percent, ensuring adequate reserves to cover potential losses. Regardless of the surviving banks’ resilience and enduring strength, challenges remain. The increase in capital has reduced key measures of profitability. Return on equity, now at 9.89 percent, is nearly two percentage points below its pre-crisis levels. The industry’s return on assets is currently 1.12 percent, lower than, but steadily approaching, its pre-crisis level of 1.22 percent. The industry’s efficiency ratio has also suffered as the excessive and complex regulations, often not tailored to the risks of specific institutions, has grown. This—not the local economic conditions—is often the tipping point that drives banks to merge and is a significant barrier to entry for new banks. Banks play a critical role in facilitating economic growth. The pace of lending, though, has decelerated over the last year and loans are growing at only half the pace of before the crisis. Banks are handcuffed by crushing regulatory costs, which in turn hurts the economy as a whole. Furthermore, even with the increase in interest rates over the last year and a half, the industry’s net interest margin remains thin. It currently sits at 3.3 percent, which is on the low end historically. Margins have been slowly improving, though, and banks are well positioned for further increases in rates. Despite regulatory burdens piled on the banking industry, hardworking, determined bankers have found a way to serve their communities and spur growth in their local economies. Jack McCabe is an economic research associate at ABA.